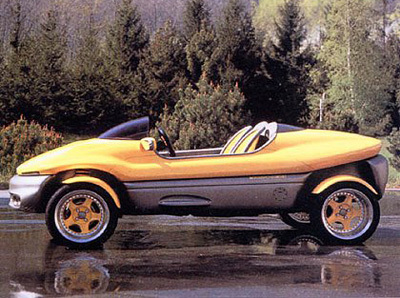 The Rush was a concept designed by the Italian automotive styling firm Bertone for Fiat. 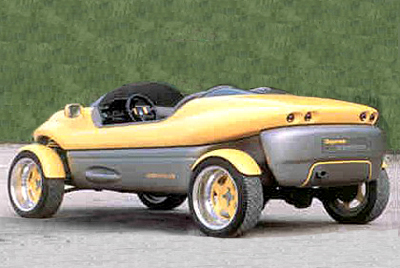 The vehicle made its debut at the 1992 Turin Motor Show. 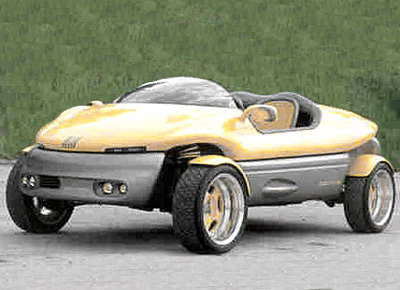 The concept was based on the mechanical running gear from a Fiat Cinquecento. But that's where the similarities end. The styling of the Fiat Cinquecento Rush was inspired by the design of American dune buggies from the 1960s, and also the appearance of buggy-style radio control cars. The car featured a simple layout and a reduced number of mechanical components to heighten the 'fun factor' and better compliment pure sense of driving pleasure. At the time of its introduction Bertone said of the vehicle: "[the Rush is...] A provocative car, certainly, but also a serious design, for its technical features and potential for industrial production." I think we all know now that it didn't make production - and it never really stood a chance either.